Our outdoor designed furniture is made from superior polyethylene-based synthetic fibers, which is both UV and weather resistant. The fibers are characterized by there durability and performance during temperature fluctuations. Resistant to pool water, sea salt, and changes in climate. Easy maintenance and a Non-toxic materials that is 100% recyclable and friendly on the environment. Our products can be left outside all year round and is able to withstand temperatures from -20¡C to +55¡C. Our cushions covers are available in Sunbrellaª fabric. The fabrics are 100% solution dyed acrylic fiber, These performance fabrics are extremly durable resistant to fading, stain, water repellant and are worry free for many years. QuickDryFoamª is produced by a special process called Hydro-blast Reticulation. Reticulated foam features large open pores with permit maximum water drainage and air circulation, allowing the cushions to dry very quickly after being wet. The foam is further protected with UREGARD anti-microbial protection. Aluminum one of our main components in our products is made from 80% recycled aluminum. Our fibers are manufactured in an environment friendly process, which do not emit any VOC. Our Aluminum frames receive a Power-coat finish for additional protection and to prolong the life of the product. Powder Coating emits zero VOC (Volatile Organic Compounds). Powder Coating overspray is 100% recycled, therefore making the process environmentally sound. Our products are 70% manufactured by hand, with minimal machine equipment. Our products are 100% recyclable and are non-toxic to the environment. Both the aluminum frame and the synthetic fibers can be recycled at your local recycling center. Our packaging is made from 45% post consumer recycled content. Availability: Products are imported and may ship in 5-7 business days if in stock. 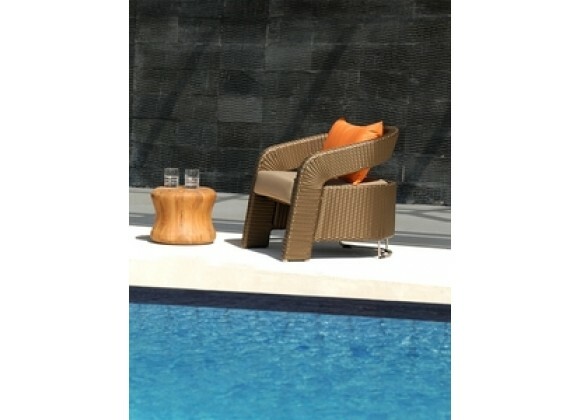 M Teak stool is a modern contemporary stool or side table that is hand spun from blocks of FSC certified Teak wood. The design and shape is based on the classic Lebello Marshmellow stool with a flat top and bottom surface. Modern contemporary stool or side table. Hand spun from blocks of FSC certified Teak wood.